Book Description: A false engagement. A mysterious coast. Two reluctant hearts. My thoughts: The book begins as Amelia makes a bargain with her father to become engaged while in Brighton, or to come home and marry the man he has chosen for her. Amelia has no desire to marry, but makes the bargain so her Aunt Margaret could be dipped into the waters and receive a cure for her bad leg. From page one this book captured my interest. Amelia is smart and capable. She also loves her Aunt deeply. 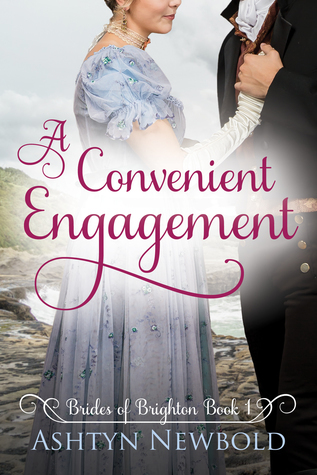 She shows resilience, conscience, and resourcefulness as she embarks on a quest to help Adam, a man she met on the beach, who will help her by entering into a false engagement to appease her father's demands. She in turn will help him find his missing sister. There are many moments that are quite funny. Amelia and Adam have great conversations. I loved the banter between the two of them. When you add an eccentric Aunt, it gets better. The characters came to life for me and I loved reading what happens next to them. I am excited that this will be a series and that I can get to know characters that appeared in this story when they have their own book. I can't wait to read them. Purchase for 99 cents on your kindle today! Or read with your Kindle Unlimited subscription! Look for the rest of the Brides of Brighton series! I am thankful for many things! Enter to win in the "Thankful for Cash" giveaway!